I love going to presidential sites, libraries and museums, included. I picked this magnet as #76, because Carter was elected in 1976, and, he was also the 76th governor of Georgia. Weird, no? 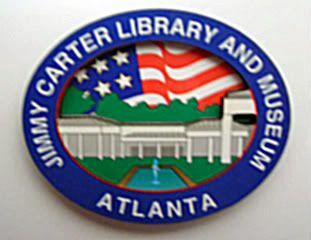 The Jimmy Carter Library is in Atlanta, and has like a weird access route...almost like you're pulling off the highway into a rest area...except that you hit the library grounds. The building is pretty cool, and the grounds are actually pretty peaceful. I enjoyed the museum itself - it was really well planned and spacious, as it guides you through his personal history, his time in office, his works/causes, etc. I gotta say, though, I must not have been paying attention... cuz apparently, his nickname? Grrrrrr. Blog ate my comment. I had expounded in detail about my trip to the museum. Hhhmph. However, Jimmy Carter? Not "Hot". "Jimmy Carter" and "hot" should NEVER be used together. Dudes. I know! Jimmy Carter is not hot...but it still cracks me up that that's his nickname. Hehehehehe. V, sorry the blog ate your comment...would love to hear about your trip.